Alameda City Treasurer Kevin Kennedy makes a point to the group attending the 3rd public Workshop on Developing A Sustainable City Budget Plan sponsored by Alameda Citizens Task Force. 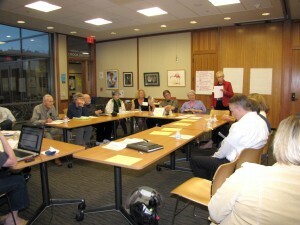 On June 6th 2011, The Alameda Citizens Task Force held the 3rd and final community meeting for “Workshop on Developing A Sustainable City Budget Plan” held at the Alameda Main Library. 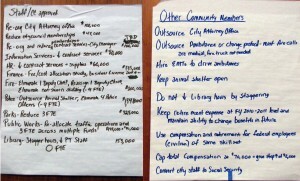 Attendees finalized recommendations developed by Alameda citizens who attended the 3 meetings. The recommendations covered public employee pensions, medical insurance benefits, contracts, salaries and overtime, cutting city expenses, and revenue enhancements for the city. The letter to the Alameda City Council can be viewed at this link. 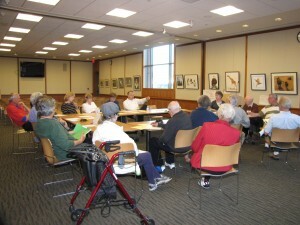 The recommendations from the Alameda City staff (on the left) to the City Council were posted so attendees to Alameda Citizens Task Force sponsored workshops were aware of what was going to happen in the city budget if public ideas were not brought forward and considered by the City Council. Other community recommendations (on the right) were also posted. Gretchen Lipow, Alameda Citizens Task Force Coordinator, presents points from one of the 6 workgroups. This entry was posted in Achieve Fiscal Responsibility. Bookmark the permalink.